Janamastami Sponsorship Opportunities ~ The Toronto Hare Krishna Temple! Participate in the magical atmosphere of resounding kirtan with six hours of non-stop kirtan! Sunday marks the actual day of Lord Krishna’s appearance. 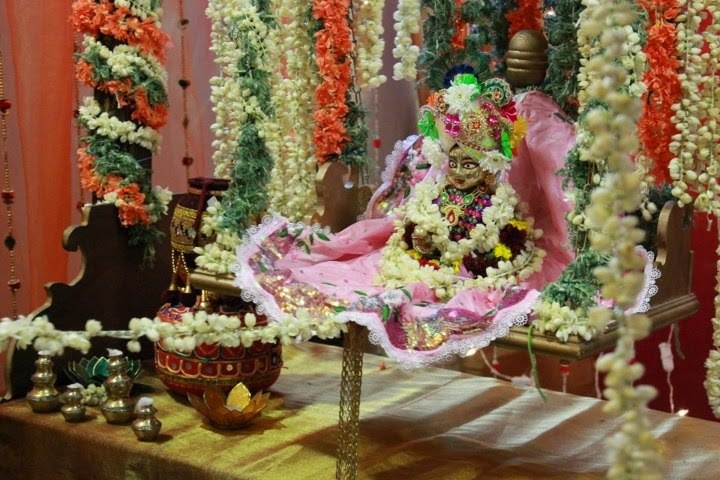 Come and enjoy the beautiful darshan of our deities Sri Sri Radha Ksira-Chora Gopinath in their splendid flower decorations and outfits (special darshan at midnight), swing baby Krishna in his opulent swing, enjoy an opulent feast and more! Free parking has been arranged on Pears Avenue (visit our website for more information). Vyasa puja or the celebration of the appearance of His Divine Grace A.C. Bhaktivedanta Swami Prabhupada, the Founder-Acharya of the International Society for Krishna Consciousness.